A few weeks ago a few of us guys completed an epic 380 mile one-day ride that we dubbed the Beermuda Triangle. This experience had opened my eyes to long distance riding and I immediately began to search for another ride to feed the itch. I had always heard of the Katy Trail up in Missouri and how cool it was, but had never ridden on it before. 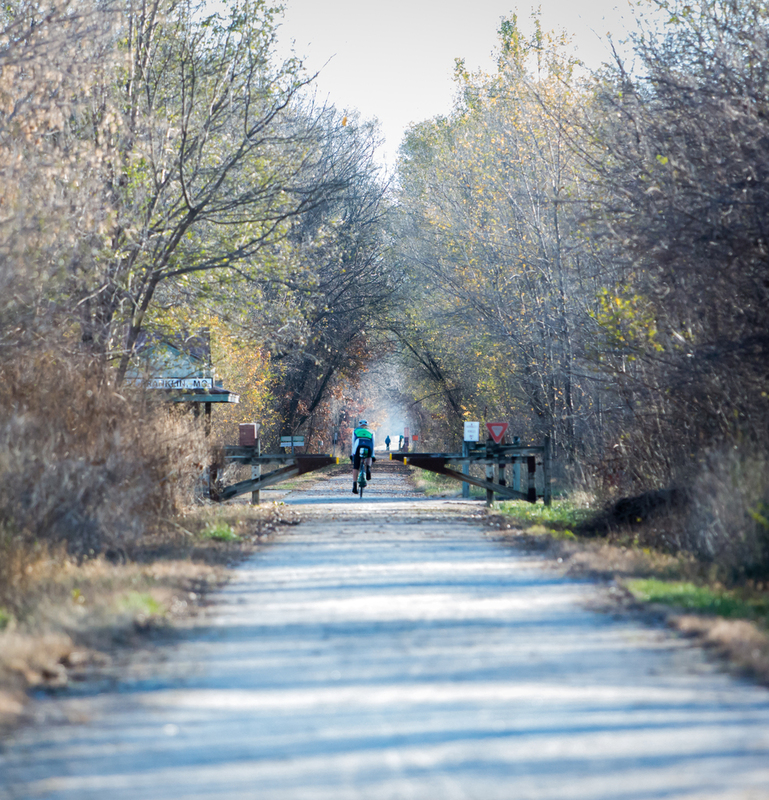 The 240 mile stretch of crushed limestone trail that extends from Clinton (south of KC) to Machens (north St Louis) is the product of a "rails to trails" program that carries a unique history, and opened officially in the early 1990's. The many small towns along the route that welcome riders and hikers into their restaurants, hotels and campgrounds, make for a really great riding experience in the heart of the United States. Somehow I ran into a few forums online that had talked about the Katy Trail FKT (fastest known time), and immediately thought this might be a cool challenge to go for. Recovering from a 380 mile ride is a tricky endeavor, and since I'd never done it before I was in new territory. I limited all my rides to 1 hour or less, ate pretty clean, and tried to get a full 8 hours of sleep every night. But I still felt pretty tired most days. I had originally planned on doing the Katy FKT a week or two after Thanksgiving, but the weather was starting to deteriorate and all forecasts looked less than doable for the foreseeable future. Then I chatted with Biff over a few beers one night, and he talked me into getting it done ASAP. And he said he'd come along for photos and support. Done deal. Western start of the Katy Trail in Clinton, Mo. The plan: Begin the day at 4:30 am on Monday, Nov 23. The time of year meant very little traffic on the trail, not as much daylight, and the weekday meant even less hikers/cyclists on the trail for me to have to buzz by. Biff and Brett would meet me every 35-40 miles at small towns along the way for support. Stops would be quick (FKT's are elapsed time which includes your stops). I would ride my Garneau Gennix R1 race bike with 26front and 28rear tires, tubeless at about 80 psi. My half frame bag would hold food and tools, and would still allow room for two water bottles. A behind-the-saddle water bottle cage would accommodate 2 more bottles full of Skratch Labs hydration mix. I had seriously considered aero bars, but had not spent any time on them so decided against. My Garmin would last up to 15 hours, and my iphone could handle music through headphones the entire way if I so chose. Food would consist of rice cakes (rice, peanut butter, eggs, bacon, honey), Skratch Labs cookies, and avocados. 4:30 am, Clinton Missouri: The pedals begin to turn in the 20 degree temps. Pain is immediate, sensations are no good, and I know I'm in for a very long day in the saddle. The thought ran through my mind "I didn't give myself enough time after the Beermuda to recover". I knew I needed to start fast in order to stay warm and so I did. 40 minutes in I hit the light on my Garmin and see 290 normalized power. SLOW DOWN. I'm warm but my hands and feet are numb. Legs already ache. I had spoken with a few people through email in the days before the ride, asking advice on the trail and about it's current conditions. A significant amount of rain had come through the area a few days before and I was warned that the trail was a little soft in spots with branches and leaves on the ground. The first 70-80 miles of the trail were a mess. Dodging branches. Leaves covering the entire trail. I even came upon 3 full size downed trees across the trail. One came up on me at 20 mph before the sun was up, and a last second bunny hop saved my day (and probably my collarbone). I also think I ran over a rabbit at some point, but can't be sure because I didn't turn around to check. The dark night is calm and cold, and despite my physical worries it's a rush to be cruising through the trees at speed. I come upon various other runners/cyclists who I assume to be locals getting in their early morning workouts before work. Biff and Brett meet me at the first checkpoint, 35 miles in at Sedalia and I already feel terrible. We make it a 1 minutes stop and I'm rolling again. The trek from Sedalia to Boonville is beautiful, and in my recollection has the most climbing. Still feeling pretty bad, I roll into Boonville - 73 miles - at around 18.6 mph avg. New bottles, food, shed some clothing, back on the road, over the bridge of the Missouri River. And into a headwind. Not a bad one, but one nonetheless. And soggy trail. Not sloppy messy trail, just soggy and soft. Soggy crushed limestone is hard to pedal through. It's the difference between 20 mph and 17 mph. I power through with a few curses under my breath here and there. I turn off my music, it's annoying me. About 10 miles outside of Boonville I hit a bump, and snap - the rear bottle cage holder breaks off my saddle. It's done. I salvage what I can and move on. It's around this point that my quads mysteriously begin to ache something awful while pedaling in the saddle. Every 5 minutes I have to stand on the pedals out of the saddle for 15 seconds to relieve the pain - something I'll have to do for the rest of the day. I've never experienced this before, and is worrisome in my mind. I have a couple of ibuprofen in my frame bag, and take them. The trail is flat and straight and empty and beautiful. And I want to quit. I decided to not wear clear lens glasses at the beginning in Clinton and the cold air did damage to my eyes. Within 30 minutes I began to have blurry vision. When the sun came up I put on my sunglasses but the blurry vision continued. Right outside of Boonville I felt my glasses start to fog. I took them off to let them vent, but it was actually my eyes that were foggy. It was so bad I couldn't even see my computer when I looked down at it. Eventually the fogginess went away, but I'd never experienced the lens of my eyes fogging up so severely. I'm having to stop once every 1.5 hours to pee. It's a balancing act. I don't want to stop and waste 30 seconds but it's a sign that I'm staying hydrated. The cold has helped in this area and I'm not having to drink as much as I would on a hot day. I can feel, however, that my wool baselayer is soaking wet from the sweat. 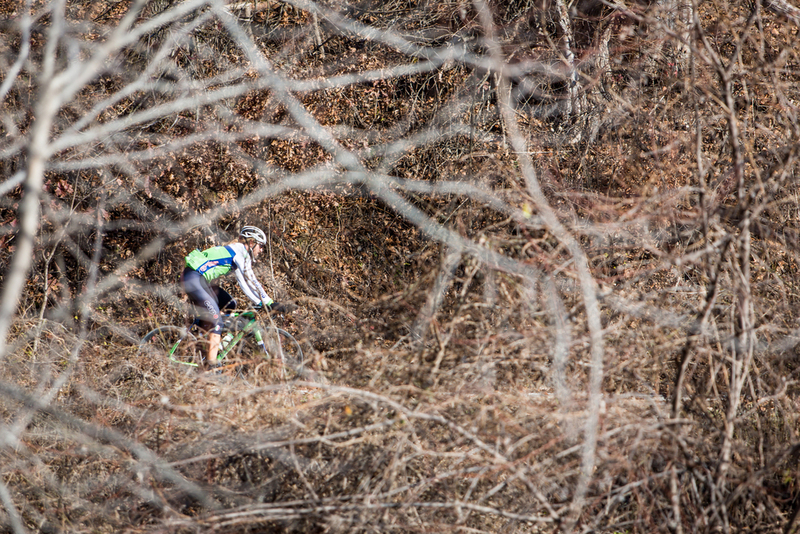 Rice cake, stand up on the pedals for 15 seconds, switch from hoods to drops, drink, dodge downed limbs, soggy sections of trail. 260 normalized power avg. I might be quitting soon. I roll into Hartsburg (population 108) at about 111 miles. Frustrated and angry and worried. I'm not having a very good day on the bicycle. The previous leg was a tough one physically and mentally. I contemplate calling it quits and heading home. My food/hydration is good. But my body just can't respond. I can see concern on Biff and Brett's face. 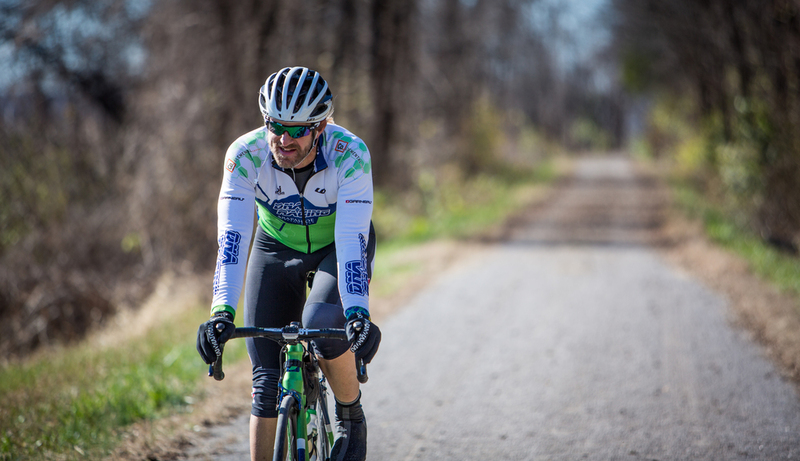 Brett keeps spirits high, moves fast, and gets me set to start back out on the next leg. The stretch from Hartsburg to Portland will be beautiful continuing along the Missouri River, and I'll finally make a more easterly turn and get a cross tail wind. Unfortunately my mind can't see the beauty, I'm not even sure I can finish this stretch. But the trip to Portland was different somehow. I felt strong-ish. I spent most of the leg in my drops, aerodynamic, and moving fast. Turned my music back on, and roll in 10 minutes before they expect me. They jump out of the car and scramble to get me set to go back out. Brett tells me I averaged 20 mph that stretch. It was to be my best 40 miles of the day. 149 miles in, 91 to go. Along the Missouri River my Garmin somehow misread my speed. It consistently showed in the 14-16 mph range on the screen, while I knew (maybe more like hoped) that it was incorrect. Occasionally it would jump to 18-20 mph for a short few seconds and then back down. In the end, I assume that the northern bluff line and tree cover along the river blocked gps to the extent that it couldn't read my speed correctly. But at the time, it constantly screwed with my mind to the point I had to change the screen on my Garmin to stop showing my current speed. 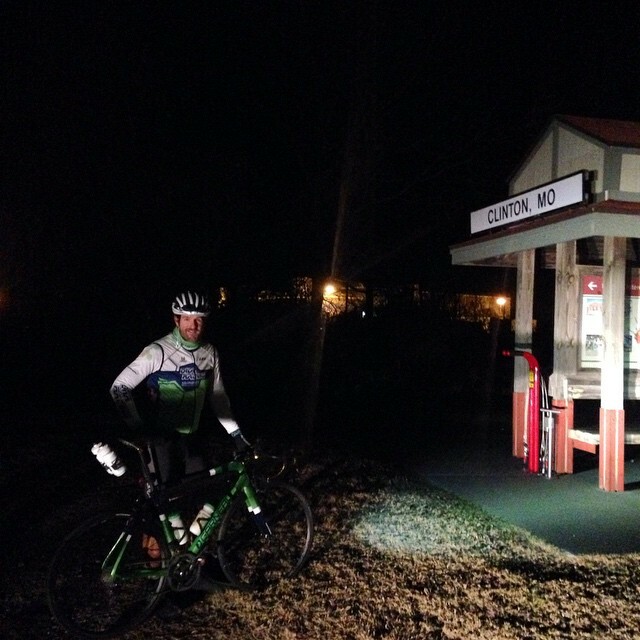 The mental darkness returns during the leg from Portland to Marthasville. My legs ache, my back spasms, neck is stiff. My mind is a mess. Conflicting voices asking to stop, and demanding to go forward. Quitting is NOT an option. Eat a rice cake. You are behind on drink, down a full bottle pronto. I begin to feel my rear tire bottom out on bumps, and look down to see it slowly losing air. My mind can't figure out how far I am from the next checkpoint. Should I try to make it, or stop and refill the air? I procrastinate for what seems like 4 hours. Finally, the tire is low enough that the decision is made for me. I stop, air it up, and get back rolling. Around the next bend are Biff and Brett waiting in Marthasville. 189 miles down, 51 to go. It's flat as a pancake from Boonville to the end in Machens. But the long straights of trail give the elusion of elevation. It constantly seemed like I was going uphill even though I wasn't, and it messed with my mind constantly over the next 9 hours. And the mindset of "flat is easier" doesn't add up on the Katy Trail. I could count on a four-fingered hand the amount of times I was able to coast during the entire 240 miles. By the end, I was begging for a hill to climb so I could coast down the backside of it. The next leg will take me 38 miles from Marthasville to St Charles and the 227 mile mark. I am starting to sniff the end. My body feels like a hammered dog turd, but my mind begins to sharpen. I know I'm approaching the finish. I spin through agriculture fields and open space, and a tailwind. I'm optimistic about upping the tempo. But in these open spaces comes endless soggy trail. I curse aloud at the trail, as if it's trying it's best to slow my pace and kill my will. I curse it over and over. I yell primal curses in the air. No one is around to hear it. My pace slows. My resolve doesn't. The sun is dipping low in the sky as I begin to enter the metro area of St Charles. The trail traffic thickens with people running or riding after work. I roll into the next check point on fumes and literally stand like a zombie as Brett and Biff put a vest on me, a light on my bike, new bottle in my cage, squeeze 2 GU packets into my mouth, and push me off into the last 13 miles of trail. The 13 miles from St Charles to Machens is a blur. The trail was a mess of leaves and downed limbs. The sun is gone and darkness returns. Not once do I look down at my Garmin. Barely holding on for the end. I feel as though I'm going 8 mph, but hope it's more like 20. Mumbling to myself. How close am I to the end? I come upon a road block on the trail. #@$% I've taken a wrong turn, gotta back track. I turn around and begin to backtrack, when my phone rings. It's Biff, "You are finished. That was the end of the trail. We can see your bike lights, but are stuck at a stopped train on the tracks. Take a picture of your bike with the Machens sign and then start heading our way." I pause for a minute, look for the Machens sign that I missed, and marvel at the anti-climactic ending to an epic day. I take that picture for my pseudo-proof of completion, and start off in the direction of the car headlights. I set off to break the fastest known time on the Katy Trail, and despite the physical problems I had was able to get it done. But in the end, I gained so much more than just a silly FKT. I got to experience glimpses of a beautiful trail in the heart of America, one that I'll soon return to in order to ride on a multi-day trip to enjoy in much fuller way. I also got to experience a true test of my limits, and to find out what I'm truly made of. Stubbornness, iron will, resolve - whatever you want to call it - got me to Machens on a day when I probably should have called it quits early. It was good for my soul, and I found out a lot about myself that day. I would encourage you to do the same in life. Massive thank you to Biff and Brett for taking time out of your life to drive and support a friend in this stupid crazy selfish endeavor. I am grateful for you guys and your help. You are a true testament to selflessness, and the definition of what we strive for at DNA Racing.